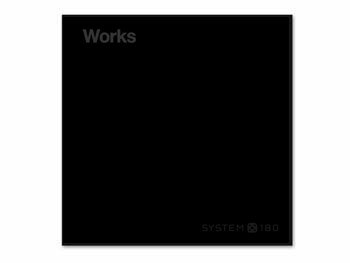 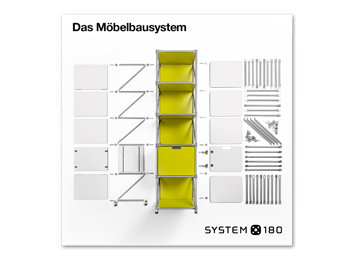 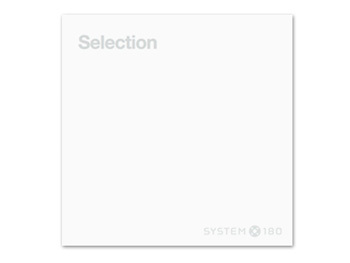 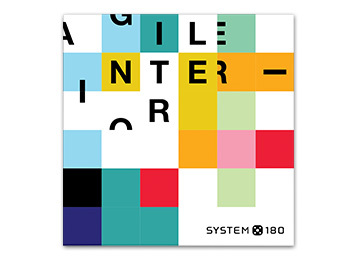 With System 180’s unique modular furniture system you can configure your individual pieces exactly as you need them. 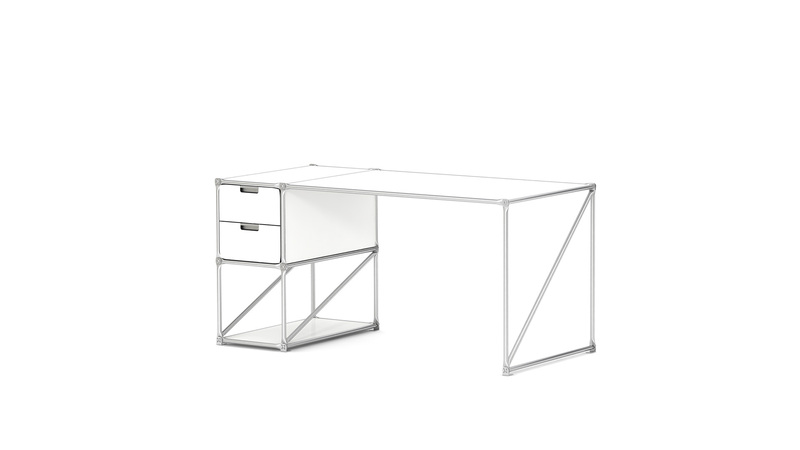 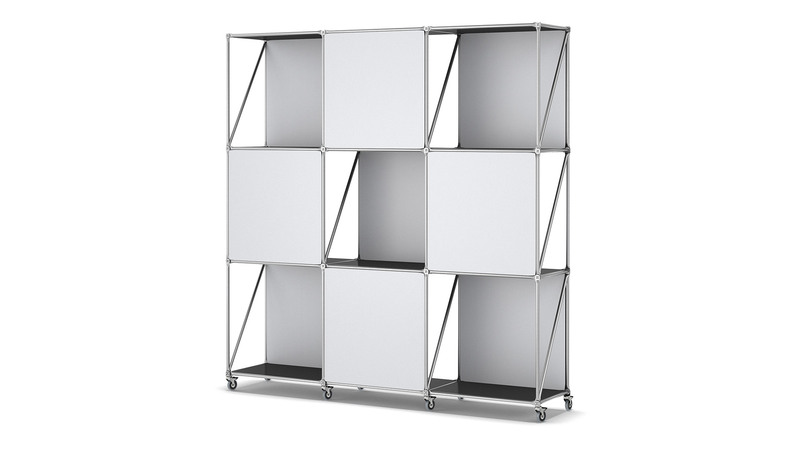 The everyday practicality of the modular furniture system is based on the standard unit of 180 mm, a spacing standard widely used in interior design. 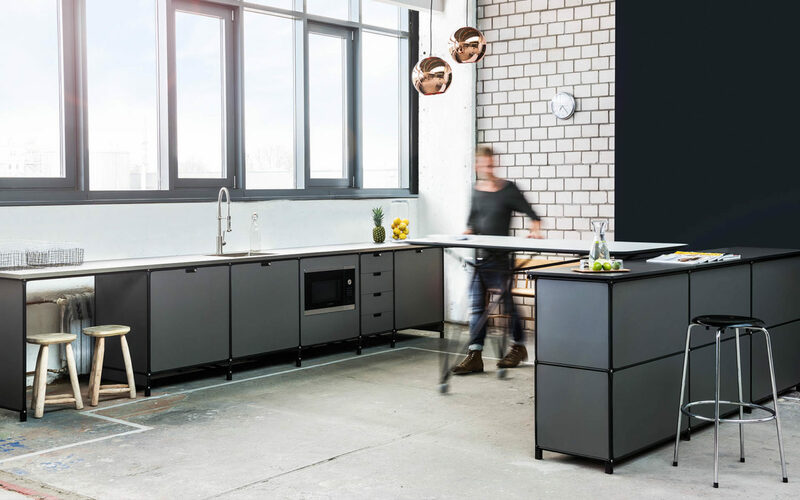 The depth of furniture bodies and surfaces are based on the applicable standards, thus providing compelling solutions for a wide variety of purposes. 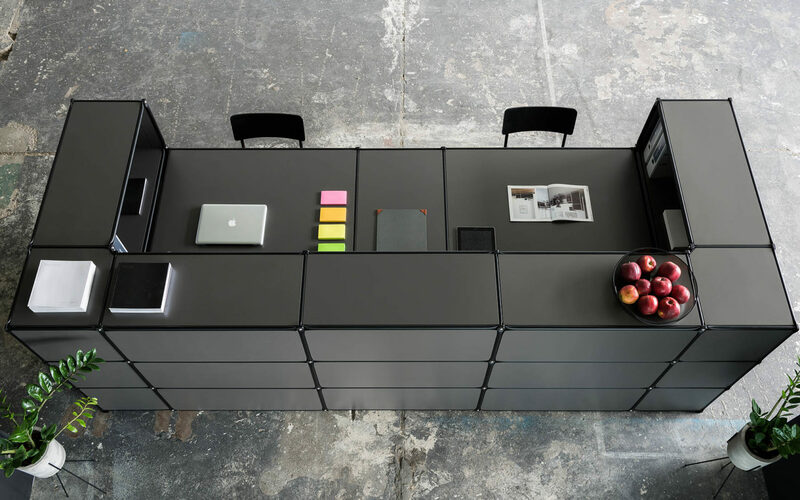 Whether you need storage, room dividers, reception counters or writing desks, the furniture system offers almost limitless possibilities. 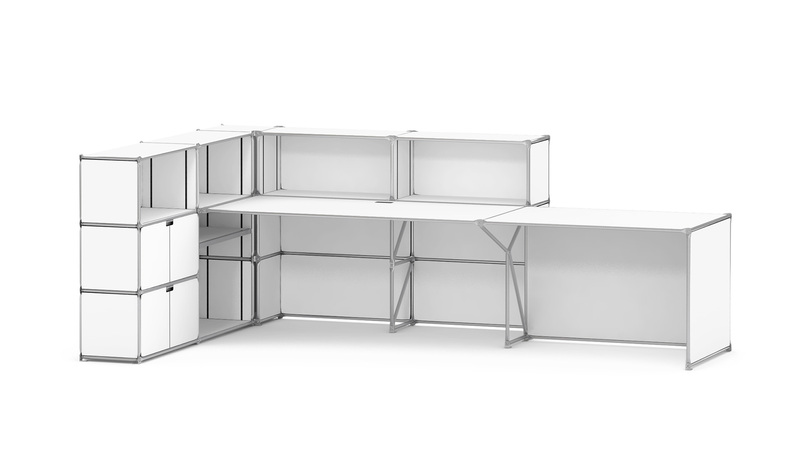 To ensure your new pieces to fit your existing furniture precisely, select from 7 graded module widths and 6 different heights. 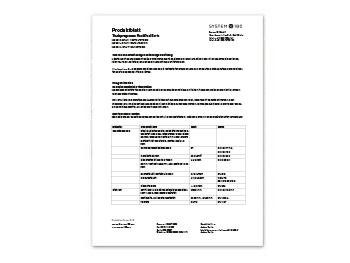 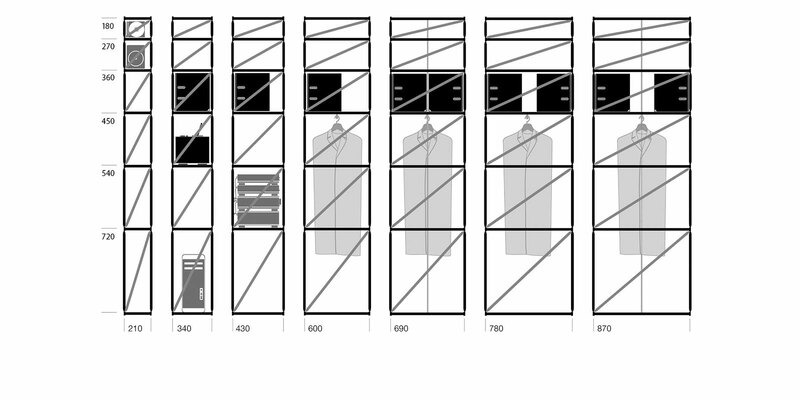 Depending on what you want to store, you can select from 7 practical module depths. 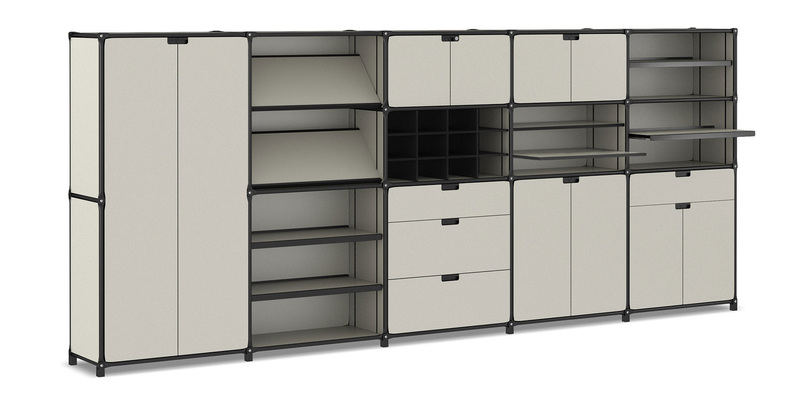 We offer a large selection of doors and drawers for all module widths and heights. 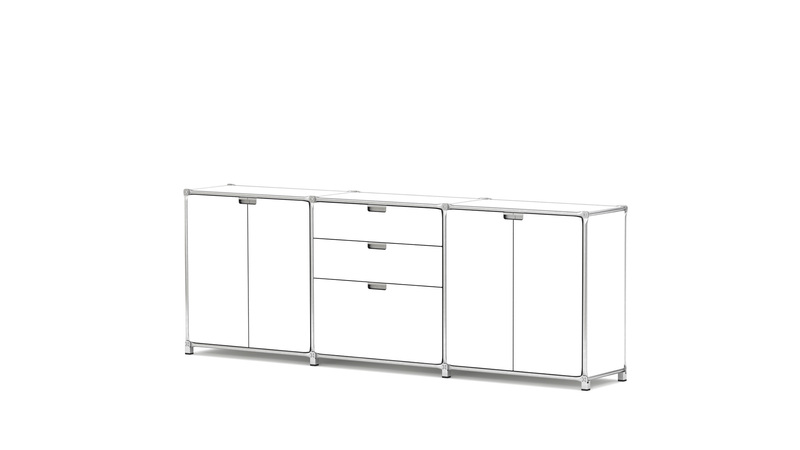 Depending on the space you have available and the use you want to put it to, you can use our modular furniture system to plan such furnishing items as sideboards, shelving and cupboards in precisely the sizes you want. 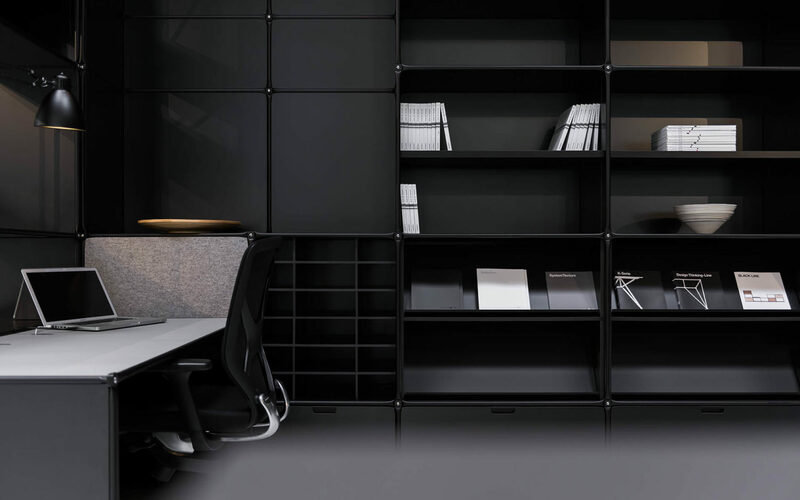 With the wide range of accessories available, including pull-out shelves, doors, drawers, magazine holders and much more, you can fit your furniture out exactly according to your needs. 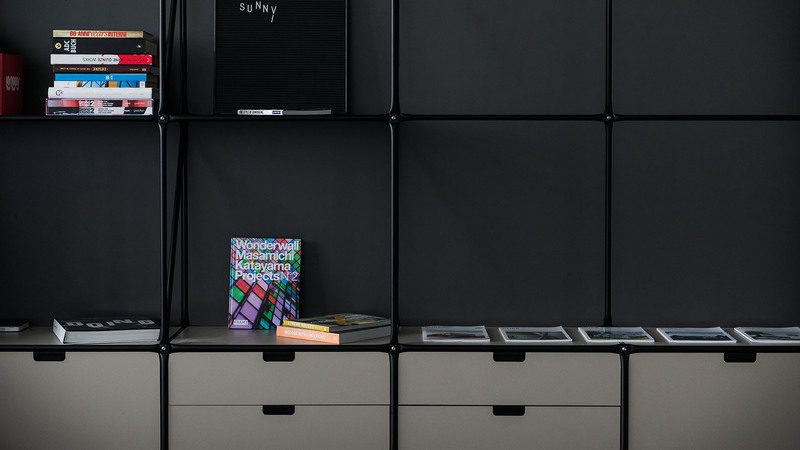 You can choose from surface finishes of various qualities and colours to suit your interior design needs. 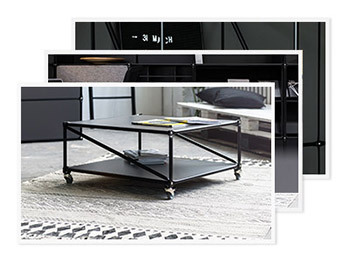 The many accessories in the modular furniture system allow you to equip your furniture pieces to suit your needs exactly. 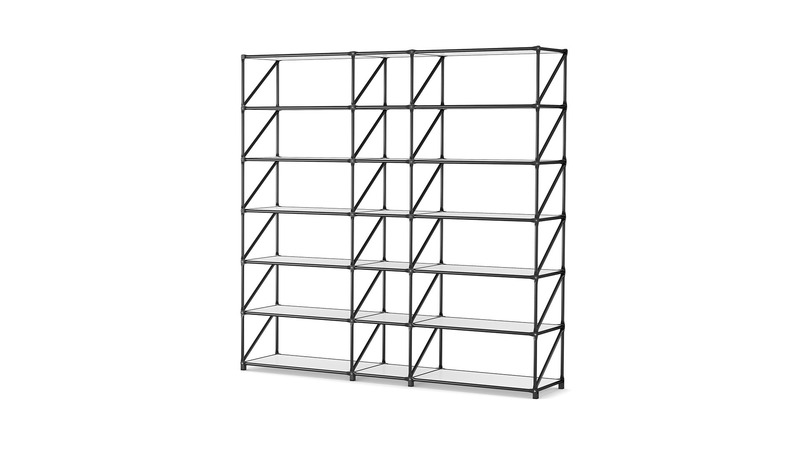 Whether you are creating a library, a materials archive, a pigeonhole system, a coat rack, a hanging folder filer or whatever – the choice is yours. 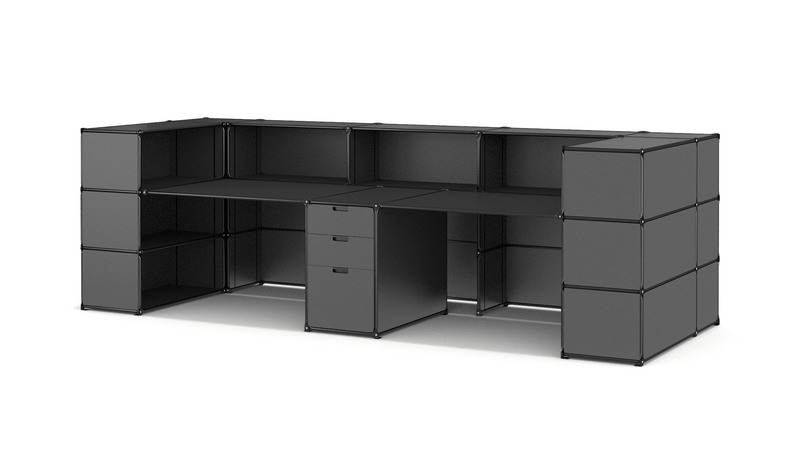 CONFIGURE YOUR CUSTOM FURNITURE NOW! 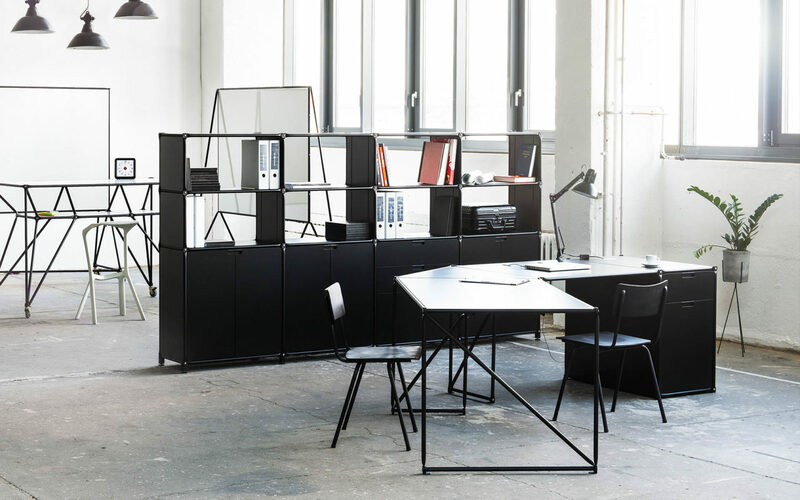 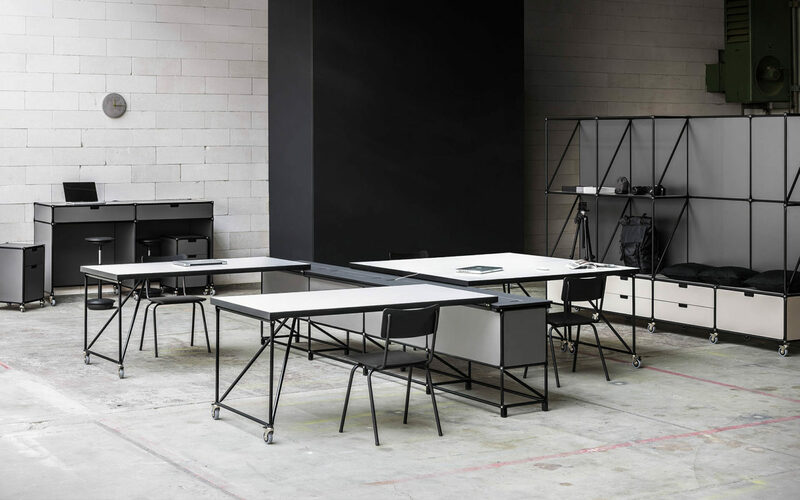 The multiplicity of the modular furniture system allows you to configure precisely designed space-defining or mobile structures, multifunctional partitions between zones or work teams. 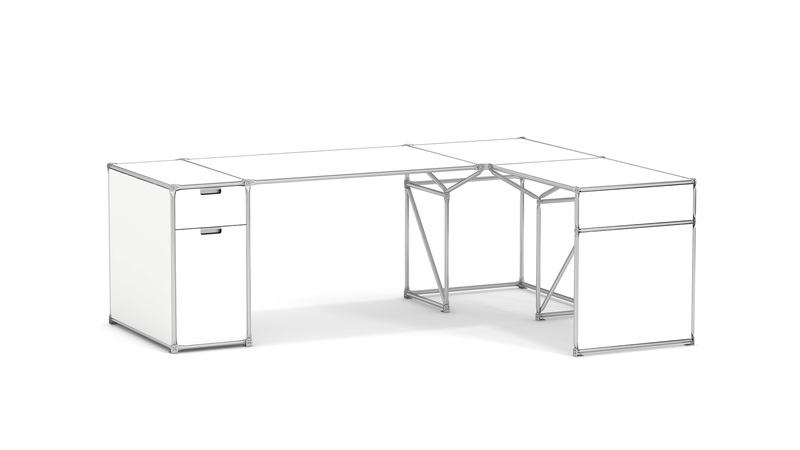 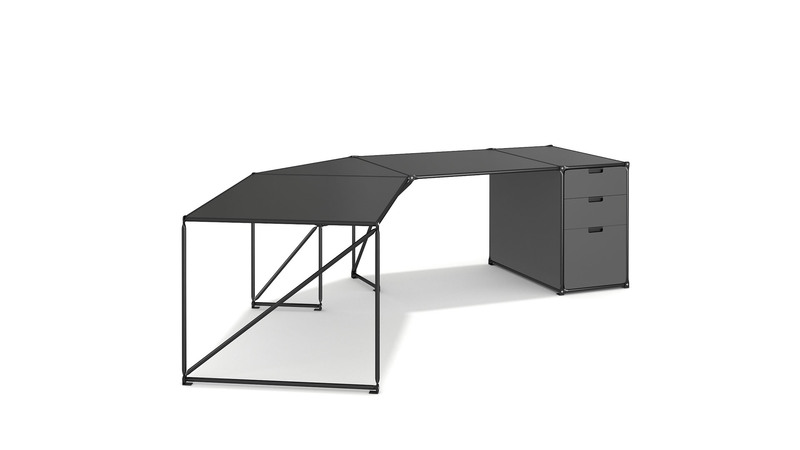 The system allows you to structure your open-plan offices and open spaces without the need to go back and consult your furniture maker. 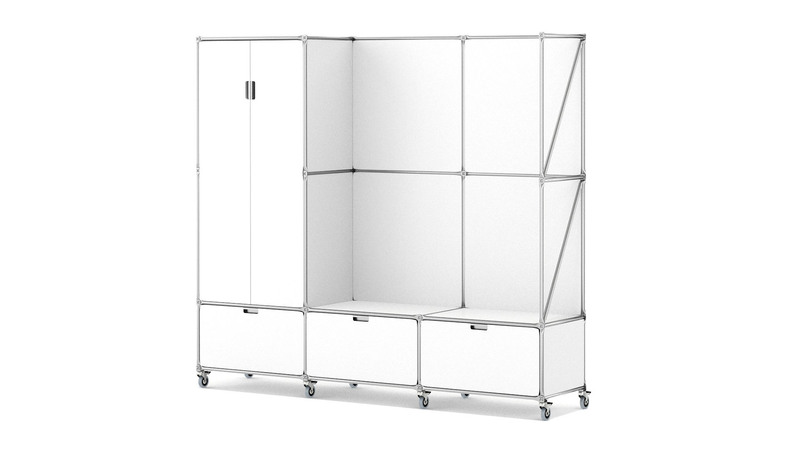 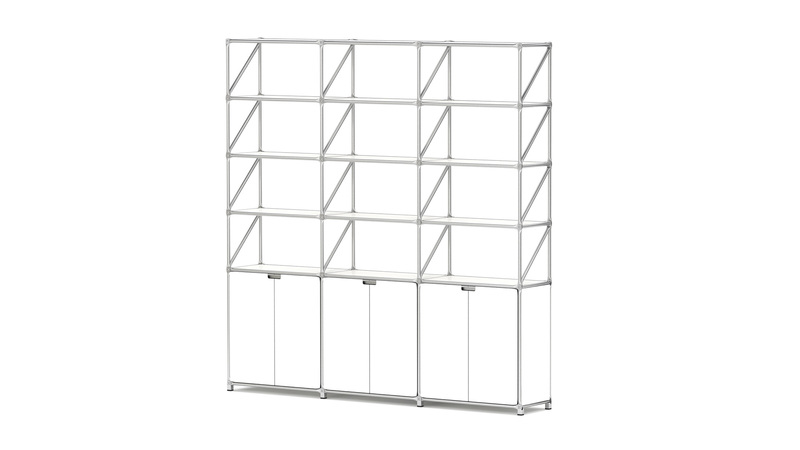 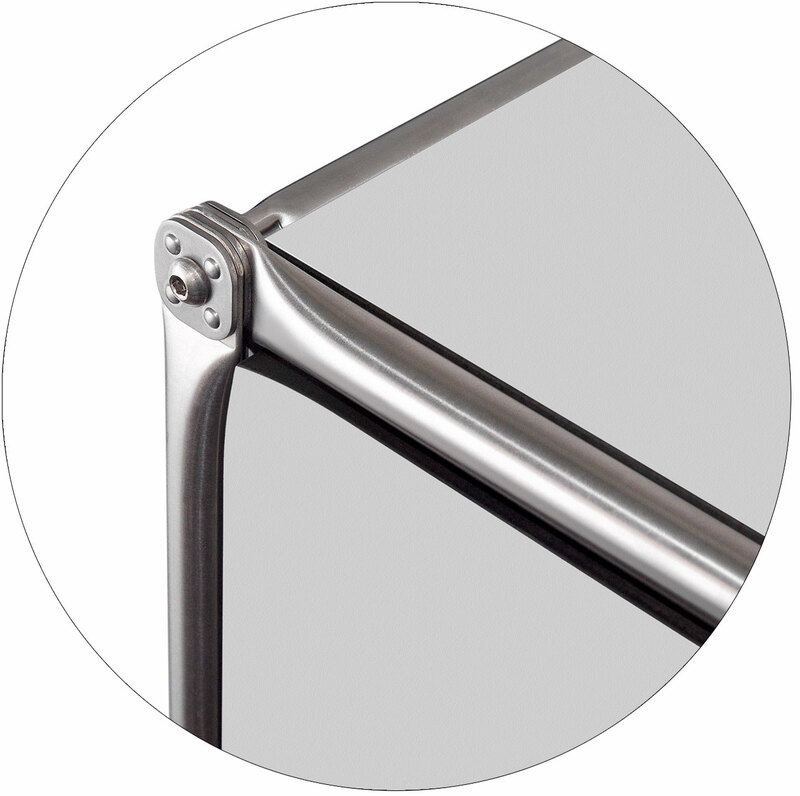 By choosing the right fittings for them, you can give room dividers additional practical roles, as screening, seating or display surfaces. 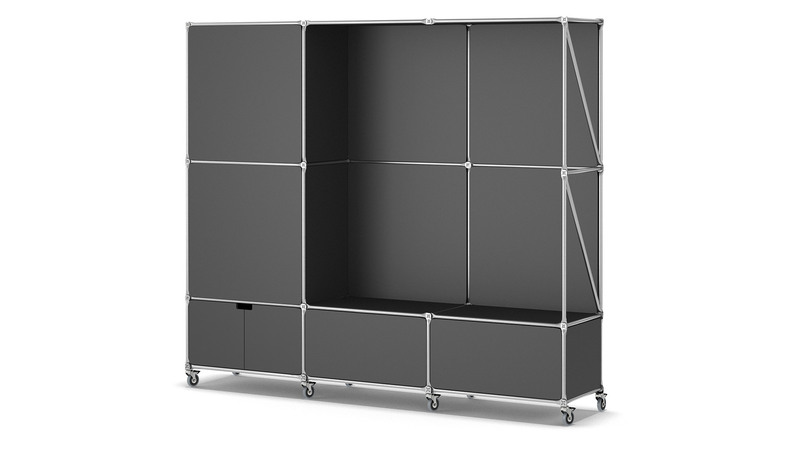 The use of easy-roll furniture casters allows even large structures to be easily moved around on flat floors. 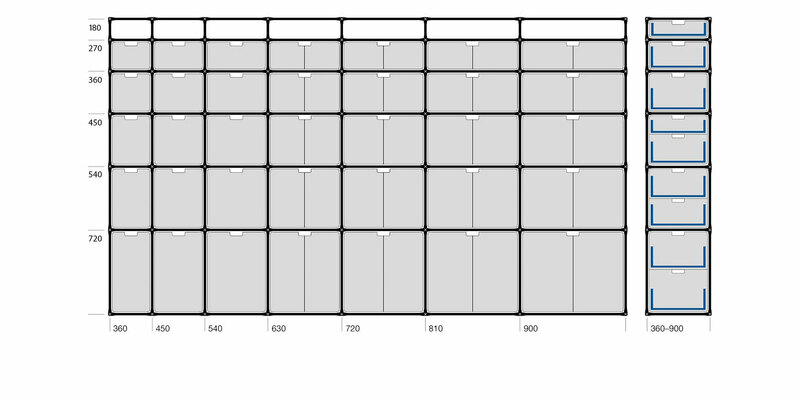 Impressive from the front, functional from the rear. 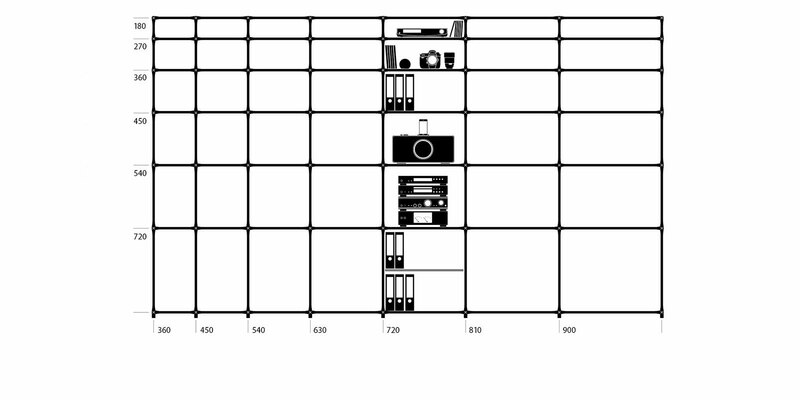 This is how the various models of counter can look. 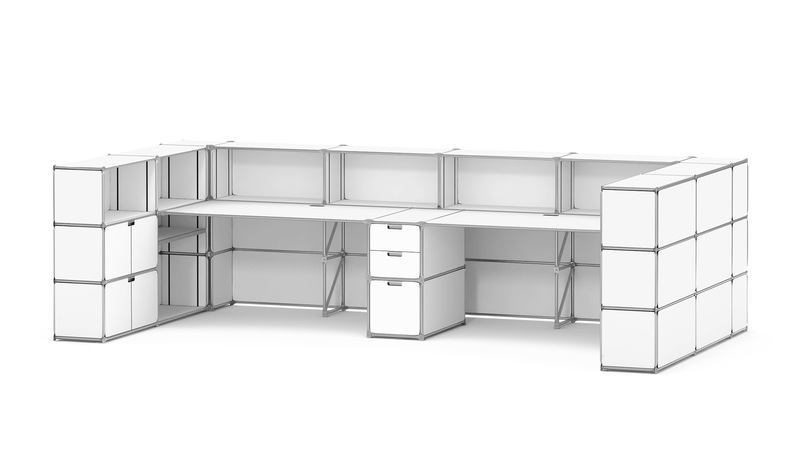 Our modular furniture system allows you to shape their layout and size precisely according to your needs. 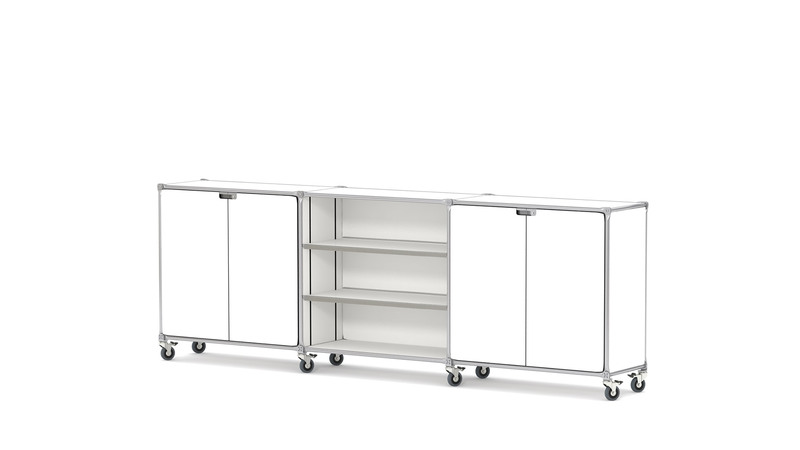 Whether you need your front counter in an I, L, or U shape, the simple and clean lines in its structure will give your visitors a positive, unfussy first impression of your company. 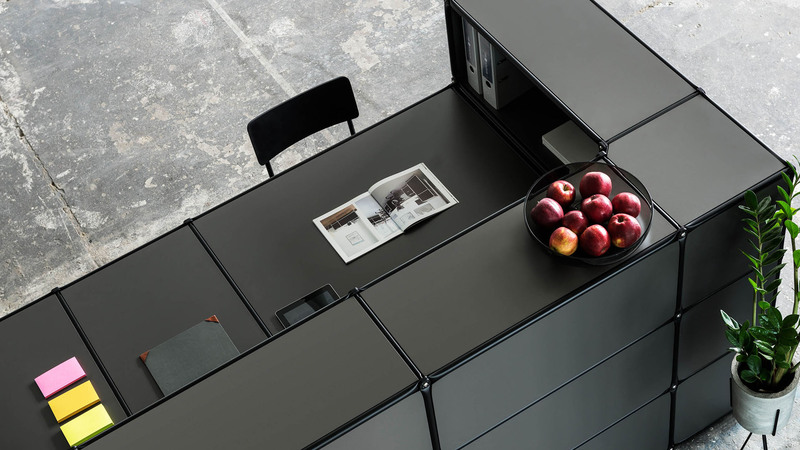 You can integrate workstations in the space behind the counter with a flexibility that caters for every need. 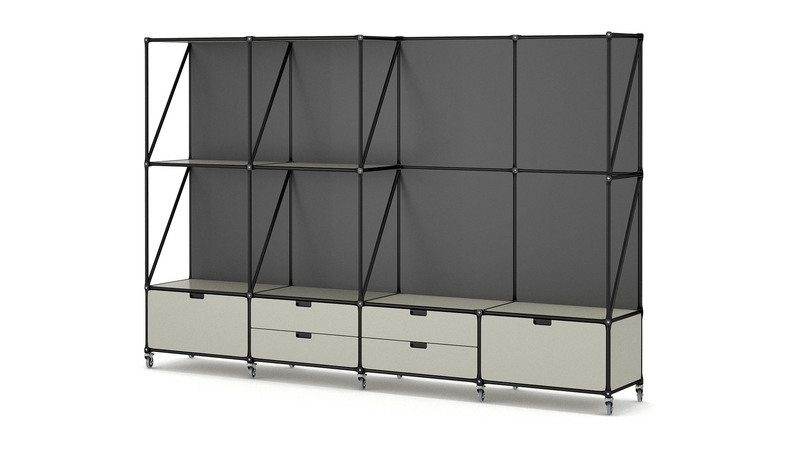 The unique construction method for our modular furniture system allows multiple combinations of storage elements with work top modules. 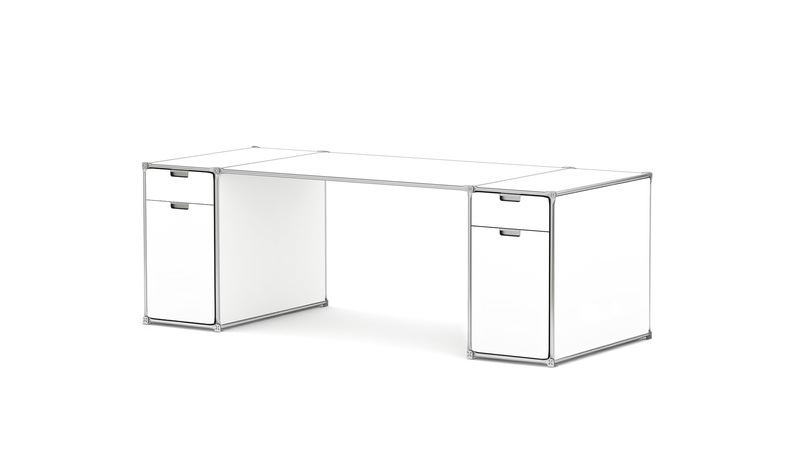 It allows you to create a wide range of combinations to suit your various complex needs. 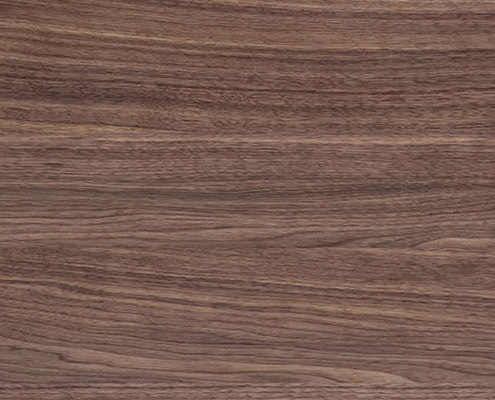 In terms of surface design, you can choose between eleven solid colours and two real wood veneers. 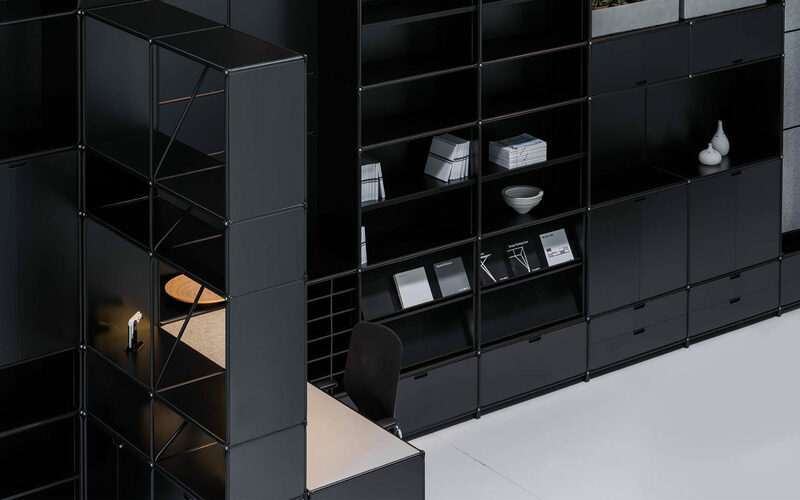 Shelving supports are made of MDF panels coloured right through in black. 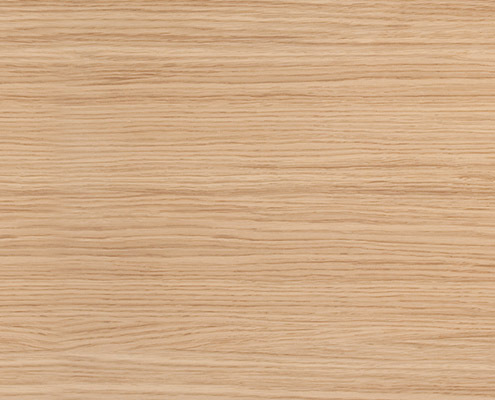 The final effect shows prominent black edges, smoothed out by an innovative System 180 process and sealed on all visible surfaces using wood oil. 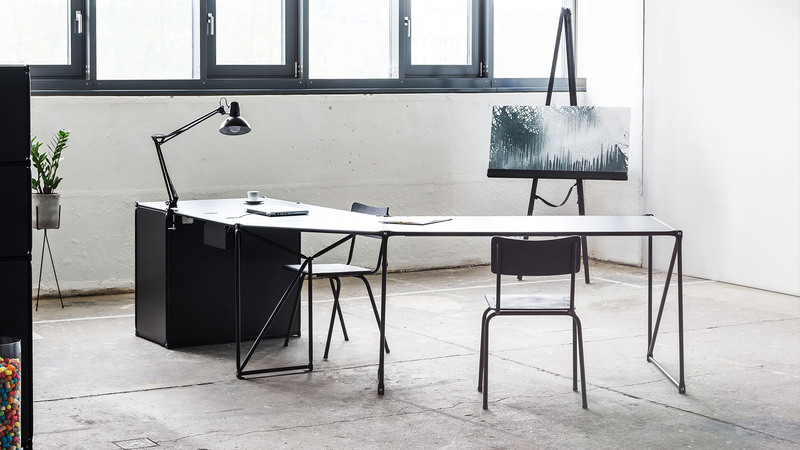 Choose between the brushed SteelLine or the powder-coated BlackLine for the steel tubing.